302 Beacon is located on the north side of Beacon, between Exeter and Fairfield, with 300 Beacon to the east and 304 Beacon to the west. 302 Beacon was built 1869-1870 for real estate dealers Samuel Horatio Whitwell and his brother, Henry Whitwell, for speculative sale, one of two contiguous houses (300-302 Beacon) designed as a matching pair. 302 Beacon was significantly remodeled in 1932. 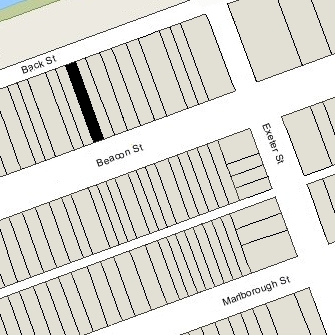 S. Horatio Whitwell purchased the land for 302 Beacon on May 21, 1870, from the Boston and Roxbury Mill Corporation. Henry Whitwell purchased the land for 300 Beacon on the same day. In both cases, the houses had been built before they took title to the land. Click here for an index to the deeds for 302 Beacon. On October 1, 1870, 302 Beacon was acquired by Samuel P. Dexter and Henry C. Wainwright, trustees under a trust established by Edward Frothingham in July of 1858. They transferred it to Francis Ware on October 25, 1871, and on the same day, it was acquired from him by Robert Shaw Sturgis, trustee for the benefit of Josephine (Borrás) Sturgis Santayana, the widow of George Sturgis and the wife of Agustin Santayana (from whom she was separated). Robert Shaw Sturgis was the brother of her deceased first husband. Josephine (Borrás) Sturgis Santayana lived at 302 with her three children from her first marriage — Susan Parkman Sturgis, Josephine Sturgis, and Robert Shaw Sturgis — and her son from her second marriage — George Santayana (Jorge Agustin Nicolas Ruiz de Santayana y Borrás), later a noted professor, author, and philosopher. 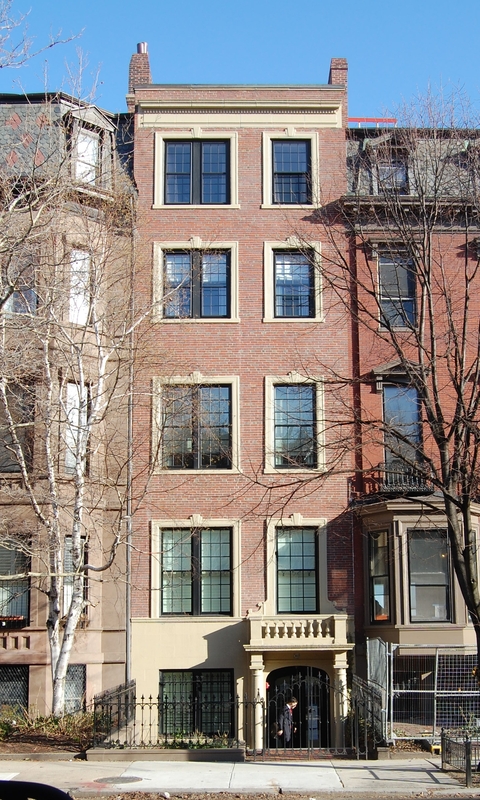 She and the children previously had lived at 17 Boylston Place. On December 7, 1875, Robert S. Sturgis transferred the property to Susan, Josephine, and Robert Sturgis, they all having attained the age of 21. Josephine Santayana and her children continued to live at 302 Beacon during the 1880-1881 winter season, but moved thereafter to 26 Millmont. On September 15, 1881, 302 Beacon was acquired from Susan, Josephine, and Robert Sturgis by Sarah E. (French) Allen, the widow of iron and steel merchant Stephen G. Allen. She previously lived n Andover, where her husband had died in October of 1878. During the 1882-1883 winter season, Mrs. Allen was living elsewhere and 302 Beacon was the home of Henry Clay Sherburne and his wife, Catherine (Kate) Augusta (Adams) Sherburne. He was president of the Northern Railroad and the New York & Boston Dispatch Express Company, and sole trustee of the Hinkley Locomotive Works. Their usual residence was in Concord, New Hampshire. Sarah Allen resumed living at 302 Beacon during the 1883-1884 winter season, but moved thereafter. On June 26, 1884, 302 Beacon was acquired from Sarah Allen by William Dean Howells. He and his wife, Elinor (Mead) Howells, made it their home. They previously had lived at Redtop in Belmont, which had been designed by Elinor Howells’s brother, architect William Rutherford Mead. William Dean Howells was former editor of the Atlantic Monthly and a prolific and popular author. The Rise of Silas Lapham, one of his best known works, was published in 1885 while he was living at 302 Beacon. During the 1885-1886 winter season, the Howellses were living elsewhere and 302 Beacon was the home of Mrs. H. E. Bridge, probably Helen A. (Holland) Bridge, the widow of Hudson Erastus Bridge, a stove manufacturer and railroad president in St. Louis, where she previously had lived. She moved by the 1886-1887 winter season, and by the 1887-1888 season probably was living at 148 Commonwealth. William and Elinor Howells resumed living at 302 Beacon during the 1886-1887 winter season, but moved soon thereafter. On May 11, 1889, the Boston Globe reported that the Howellses were “coming back to Boston to live” and were staying temporarily at the Hotel Vendome. By the 1890-1891 winter season, they lived in an apartment at The Abbotsford at 184 Commonwealth. By the 1891-1892 season, they had moved to the Hotel Berkeley (southeast corner of Berkeley and Boylston), and soon thereafter they moved to New York City. On April 30, 1887, 302 Beacon was purchased from William Howells by Edwina (Booth) Grossman, the wife of stockbroker Ignatius R. Grossman. They previously had lived at 29 Chestnut with her widowed father, Edwin Thomas Booth, the noted Shakespearean actor (brother of Lincoln’s assassin, John Wilkes Booth). The Grossmans continued to live at 302 Beacon during the 1889-1890 winter season, but moved thereafter to New York City. Edwina Grossman continued own 302 Beacon and lease it to others. By the 1890-1891 winter season, 302 Beacon was the home of Miss Ellen Maria Chandler. She previously had lived at 154 Beacon with her widowed father, Peleg Whitman Chandler, who died in May of 1889. She continued to live at 302 Beacon in 1897, but had moved to 346 Beacon by 1898. The house was not listed in the 1898-1900 Blue Books. By June of 1900, 302 Beacon was the home of Dr. John Bapst Blake and his wife, Anne (Hastings) Blake. They had married in October of 1899 and 302 Beacon probably was their first home together. Prior to their marriage, he had lived at 212 Beacon with his parents, John George Blake and Mary Elizabeth (McGrath) Blake. John Bapst Blake was a physician and surgeon. He maintained his practice at 212 Beacon with his father and brother, Gerald Blake. He later would become surgeon-in-chief at Boston City Hospital and a professor of surgery at Harvard Medical School. The Blakes continued to live at 302 Beacon until late 1903, when they moved to 178 Beacon. 302 Beacon was not listed in the 1904 and 1905 Blue Books. By the 1905-1906 winter season, it was the home of Dr. John P. Sutherland and his wife, Evelyn (Baker) Sutherland. They previously had lived in an apartment at 295 Commonwealth. John Sutherland was a physician. He was Dean of Boston University Medical School from 1899 to 1923, and Dean Emeritus thereafter. Evelyn Sutherland died in December of 1908. John Sutherland continued to live at 302 Beacon in 1910, but moved soon thereafter to an apartment at 295 Commonwealth. In March of 1911, 302 Beacon was purchased from Edwina Grossman by Dr. Malcolm Storer, a physician. He and his wife, Grace (Ayrault) Storer, made it their home. They previously had lived at 5 Brimmer. They also maintained a home in Islesford, Maine. They continued to live at 302 Beacon until 1929. By 1930, they had moved to 380 Beacon. In May of 1929, 302 Beacon was acquired from Malcolm Storer by real estate dealer Henry C. Brookings. The property changed hands, including going through foreclosure, and in March of 1932 was acquired by Louis J. Binda. He was an elevator starter at a downtown Boston building who frequently held property for various other owners. He was unmarried and lived in Roxbury. In June of 1932, Edmund Binder (probably a misreading of Louis Binda) applied for permission to convert the house from a single-family dwelling into five apartments, including removing a wooden ell at the rear and building a new front elevation. That same month, 302 Beacon was acquired by Allen Payson Saul (born Abraham Salinsky). He was a chiropodist and operated the Allen Payson Company, dealers in elastic stockings. He was unmarried. He previously had lived at 1680 Commonwealth in Brighton. In July of 1932, Allen Saul re-applied for (and subsequently received) permission to convert the property into five units, remodeling it the manner proposed in the earlier permit application. The remodeling was designed by architect Parker J. Brown. By 1934, Allen Saul had been joined at 302 Beacon by his sister, Della Saul (the former wife of George Lapidus), and her son, Robert Jason (Lapidus) Saul. She also was a chiropodist and operated Caporn Correct Corsetry conjunction with her brother’s elastic stockings business. In December of 1934, Allen Saul transferred 302 Beacon to Della Saul. In October of 1936, 302 Beacon was acquired from Della Saul by Theodore W. Berenson, trustee of the Beaconson Trust, a real estate investment trust. He and his wife, Evelyn Harriet (Green) Berenson, lived in Brookline and then Newton. Allen and Della Saul continued to live at 302 Beacon until 1942, but had moved to 35 Marlborough by 1943. In June of 1944, 302 Beacon was acquired by Charles Stevens of Lydonville, Vermont. In October of 1946, 302 Beacon was acquired from Charles Stevens by Lawrence Rill Schumann, a brush manufacturer. He and his wife, Ruth D. (Levine) Schumann, lived in Forest Hills, Long Island. In March of 1948, Lawrence Schumann transferred 302 Beacon to himself as trustee for his daughter, Laurel Dorothy Schumann, a student at Boston University. On the same day, he transferred the property to Paul D. Turner of Malden, who held the property on his behalf. Lawrence Schumann, trustee, remained the assessed owner. At about the same time, Lawrence and Ruth Schumann separated and he moved from New York to an apartment at 302 Beacon. They divorced in 1950. In the early 1950s, Lawrence Schumann purchased the art collection of Mrs. Marie (Walther) Sterner Lintott, an art dealer in New York City, including about 300 American and European paintings, water-colors, and drawings. In November of 1951, he purchased 191 Marlborough, possibly with the idea of housing the collection there, which he may have done. While he owned the house, it was shown as vacant in City Directories and was not included in the Lists of Residents. By mid-1952, Lawrence Schumann had married again to Mrs. Edith (Rader) Jarcho, the former wife of Saul Jarcho. After their marriage, they lived at 302 Beacon. In October of 1957, Lawrence Schumann, as trustee for his daughter, acquired 302 Beacon once again and, on the same day, transferred it to Patricia A. Risser of Somerville, who held the property on his behalf. From 1960 to 1966 he served as honorary Austrian Consul General in Boston. In October of 1971, Patricia Risser transferred the property to Laurel Schumann, at that time a resident of Hollywood. Lawrence and Edith Schumann continued to live at 302 Beacon until about 1974. By the time of his death in October of 1975, they were living in an apartment at 330 Beacon. In November of 1974, 302 Beacon was purchased from Laurel Schumann by John L. Hayden. The property changed hands and in September of 1995 was purchased by Louis James Wiczai, Jr., an executive with Brigham and Women’s Hospital, and his wife, Karen K. Kirby. In October of 1996, they converted it into two condominium units: the Rockland Boston Condominium.